It’s pretty amazing to me that we’re still discovering new uses for a drug as old as aspirin. The active metabolite of aspirin—salicylic acid—has been used to treat ailments for several millennia. In fact, the ancient Egyptians and Greeks even used teas and other potions brewed from the bark of the willow tree, which is rich in salicylic acid, to treat their fevers, headaches, and pains. Today, as many of you may already know, low-dose aspirin can play a key role preventing heart attacks and strokes; it’s often prescribed as a daily therapy for people who’ve suffered a heart attack or are at high risk of one. But it doesn’t stop there. Scientists are now exploring whether this pharmaceutical multitasker can also suppress cancer. This study , published in the New England Journal of Medicine, included 964 patients who had been diagnosed with colon cancer and had had their tumor DNAs analyzed. The researchers also knew which individuals were taking aspirin. 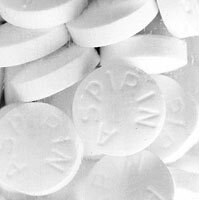 Five years after their cancer diagnosis, 97% of patients with PIK3CA mutations who were taking aspirin were still alive, compared to 74% of similar patients who didn’t take the drug. Strikingly, the aspirin provided no benefit for colon cancer patients whose tumors had normal copies of the PIK3CA gene. Why is this? The researchers hypothesize that the mutated PIK3CA gene acts like an oncogene, fueling cancer growth by putting cells into overdrive and making them relatively immune to cell death. The aspirin, they believe, somehow blocks this effect, making it easier to kill off the cancer cells. If these results are replicated, doctors might use the presence of the PIK3CA mutation in colon cancer tissue as a screening tool or biomarker to identify patients who would benefit from aspirin in addition to surgery or other therapies. Some might argue it would be easier just to recommend aspirin to everyone with colon cancer, but that might be risky because aspirin does increase the risk of bleeding. Personalizing or choosing drug regimens to match each person’s unique genetic makeup is called pharmacogenomics. This field is absolutely booming, and it’s becoming obvious that our current “one-size-fits-all” model of using aspirin and many other drugs will soon give way to personalized, or what many are now calling “precision,” medicine. So, for colon cancer and a wide variety of other conditions, I fully expect the variations hidden in your genes will someday help your health-care provider choose the medicines that work best for you, and at the dose that is right for you. And that’s something that even King Tut with all his treasures couldn’t buy! Aspirin use, tumor PIK3CA mutation, and colorectal-cancer survival. Liao X, et al. N Engl J Med. 2012 Oct 25;367(17):1596-606.